Bishop Ha was born in Hong Kong on 4 March 1959. He worked in the field of banking before finding his vocational calling after a pilgrimage to a Marian shrine. 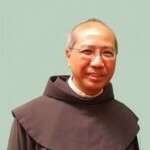 He joined the Order of Friars Minor in 1984, and received basic religious formation in Taiwan. He was ordained as a priest on 9 September 1990 at the Cathedral of the Immaculate Conception, Hong Kong. Since his ordination, he has served as parish priest in St. Bonaventure Parish, Our Lady Queen of Angels Parish, and as Parochial Administrator of St. Francis’s Parish. He was also appointed as supervisor of St. Bonaventure College & High School, St. Bonaventure Catholic Primary School and Tsz Wan Shan St. Bonaventure Catholic Primary School. He has also been a member of the Hong Kong Catholic Board of Education since 2011. He has also been elected twice as the President of the Franciscan Foundation in Hong Kong (in 1999 and 2010 respectively). Rev. Ha is a renowned theologian and an expert in spirituality, who holds a Master degree in Spirituality from Pontifical University Antonianum. On 11 July 2014, Rev. Ha was appointed as one of the three Auxiliary Bishops of Hong Kong by Pope Francis, holding the titular see of Simitthu. He was then ordained as bishop on 30 August 2014, with Cardinal John Tong Hon, Bishop of Hong Kong, as his principal consecrator.